It’s no secret to people who know me that I love Spain. 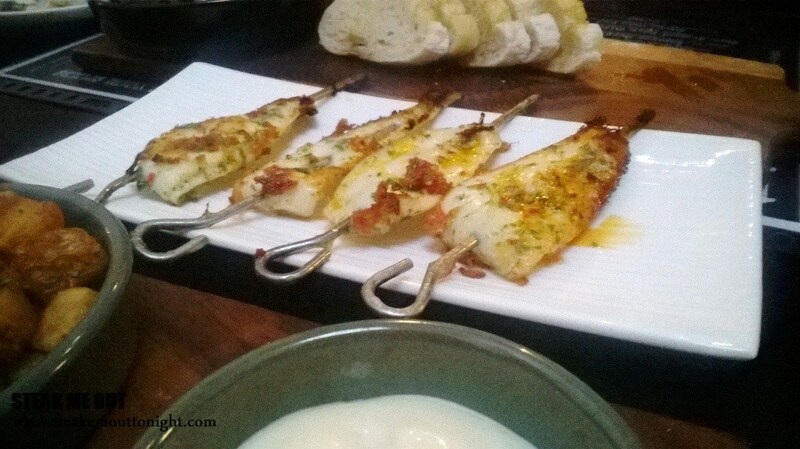 I spent the a month there this year, and while in San Sebastian I tried to eat at each of the 38 pixtos bar that appeared on a map I acquired. 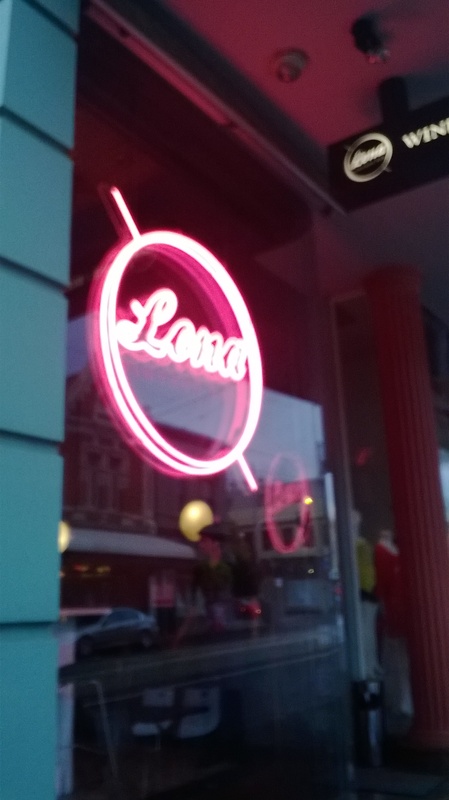 When I heard of Lona, I patiently waited until the opportunity arose to get down there. As usual I did my research beforehand and knew exactly what I was going to order. We arrived at about 8 on a slightly depressing Tuesday to a literally empty venue. There was no one in there except staff. The place on the other hand was, sleek, modern and classy. My dreams of trying all the pixtos were crushed when the waiter said they only had 5 different types tonight. 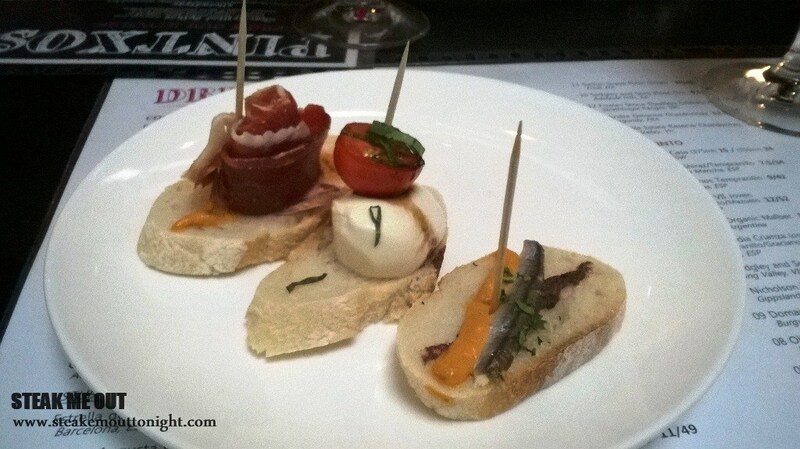 Of the 5, only 3 appealed to me: the Jamon Serrano with spicy confit tomato puree, the white anchovy with olive tapenade and tomato smoke and the bocconcini with basil & fig chutney. All were good. The Anchovy one was very light; with the fish not being marinated was good but lacking in quantity as you can see. The Jamon was nice, but it was standard Jamon. The cheese however was great, really soft and melt in your mouth with the drizzle of balsamic a good touch. It was the best one out of 3. 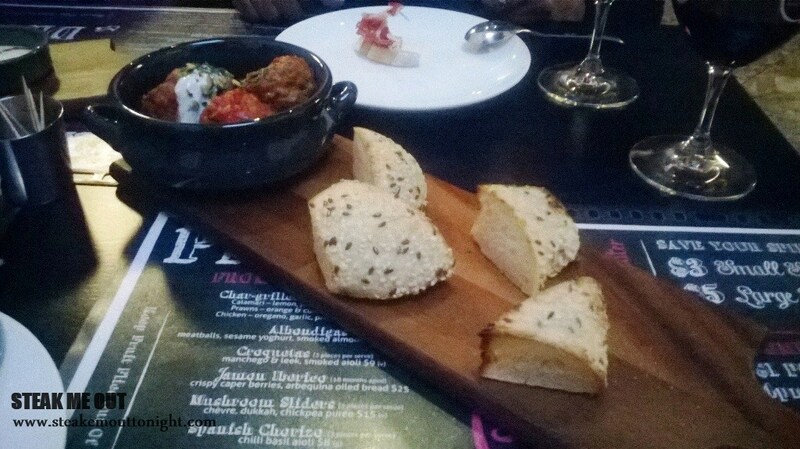 After we’d tried those we moved onto the Hot “made to order” tapas style stuff. Between the four of us we ordered the slow braised pork sliders with jalapeno, crackling and chipotle ($16), the patatas bravas ($9), lamb cutlets coated in chermoula spice served with honey sumac yoghurt ($15), grilled calamari with lemon, parsley, garlic and chilli ($8) and the albondigas meatballs served with sesame yoghurt, smoked almonds and torn bread ($14). 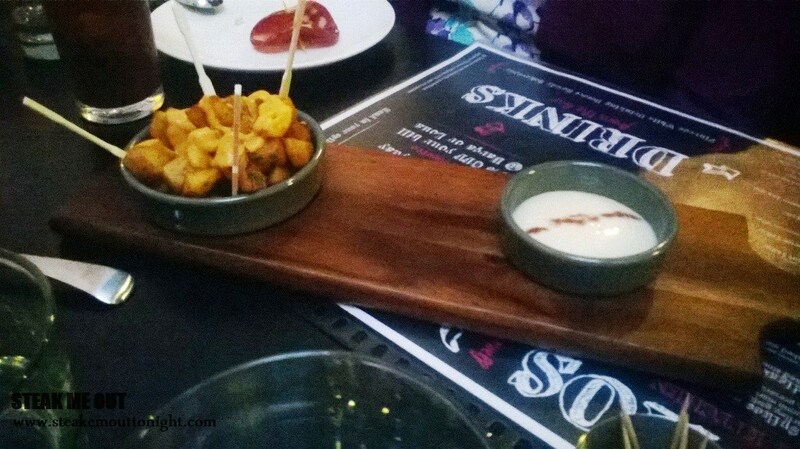 The patatas bravas was nice, it had a great garlic hit on the aioli whereas the chilli was good, but too creamy and not hot enough to complement the garlic and potato. That’s not to say we didn’t devour everything, it was still delicious. The meatballs had a Moroccan tomato flavour, and were juicy and tender. Having been cooked really well and combined with good meat, the almonds and yogurt gave nice contrasting textures and tastes. 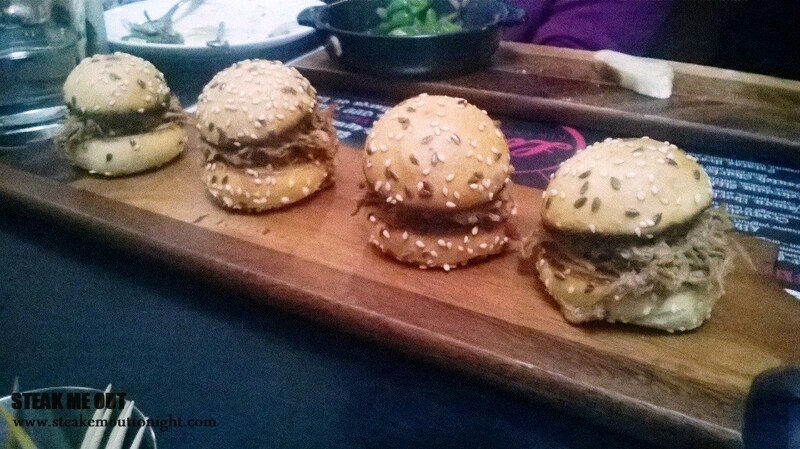 The slider was fantastic, melt in your mouth meat with so many contrasting flavours due to the sweet tang of the chipotle then the heat from the jalapeno, finishing with the crunch from crackle. The stand out of all the dishes though, was the cutlets. Coated in the spice rub was really intense and complex on the palate while, being tremendously tender. Definitely recommend these. 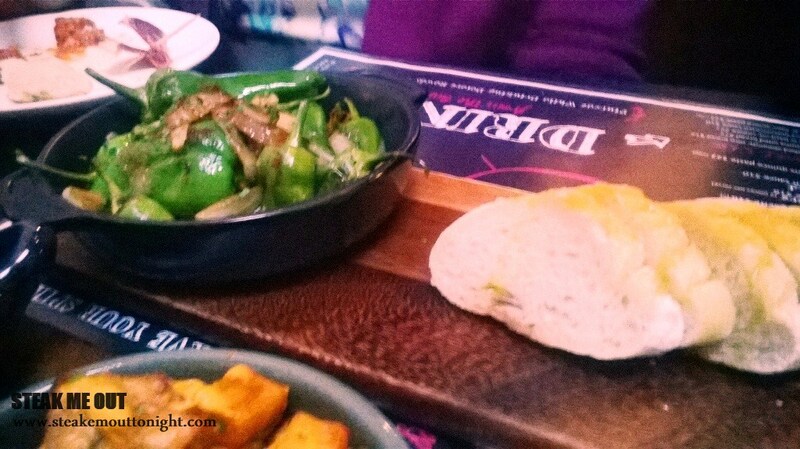 After gorging ourselves on tapas at Lona Pixtos we headed up the street to their sister restaurant Barca for dessert. After scanning the menu, which was quite extensive and interesting, we ordered the Crème brûlée, a cheese plate and the kicked over flower pot (their signature dessert). 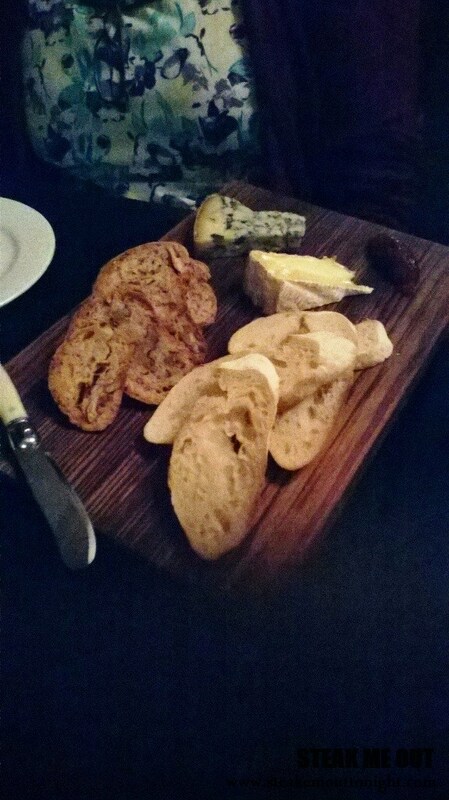 For the cheese plate we ordered the Blue cheese and the brie. The blue was great (but I am slightly biased towards it as it’s my favourite) while the brie was smooth, though perhaps overly creamy and left you wanting more flavour. 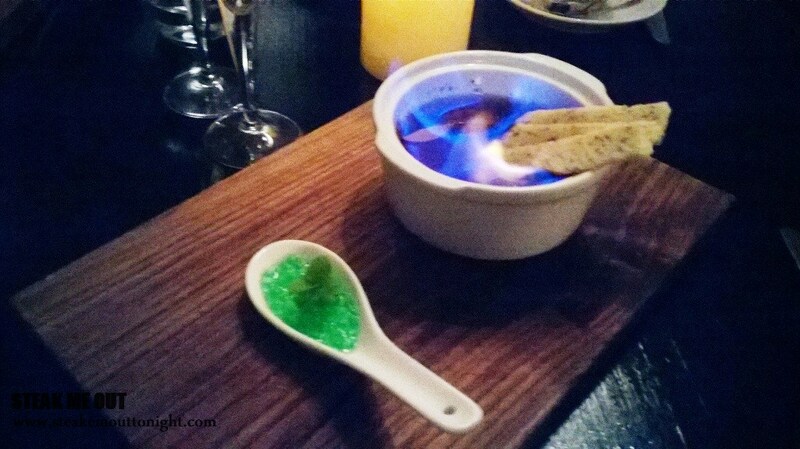 The Crème brûlée, visually stunning was placed on the table then the waitress lit the top to create the sugared top, the end product still had a lot of alcohol but once that subsided the custard and sugar flavours churned together well. 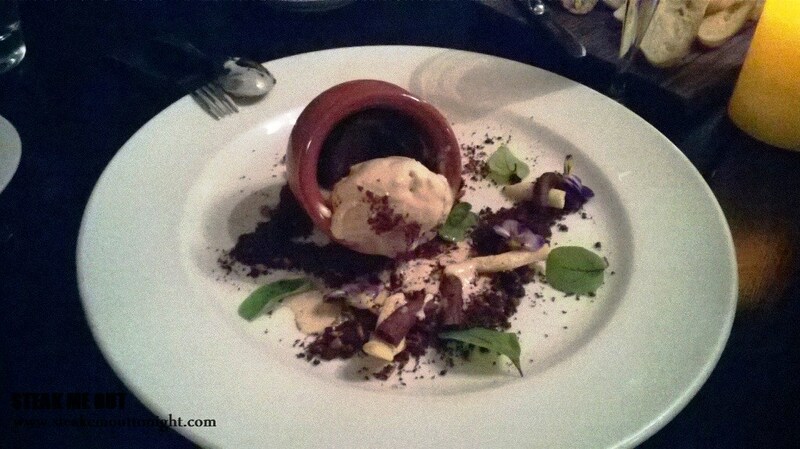 The presentation of the kicked over flower pot was very cool; choc hazelnut biscuits as dirt, a molten cake in the actual pot and edible flowers and ice cream to top. The essence of the dish was great however the actual chocolate cake was lacking the chocolate hit. 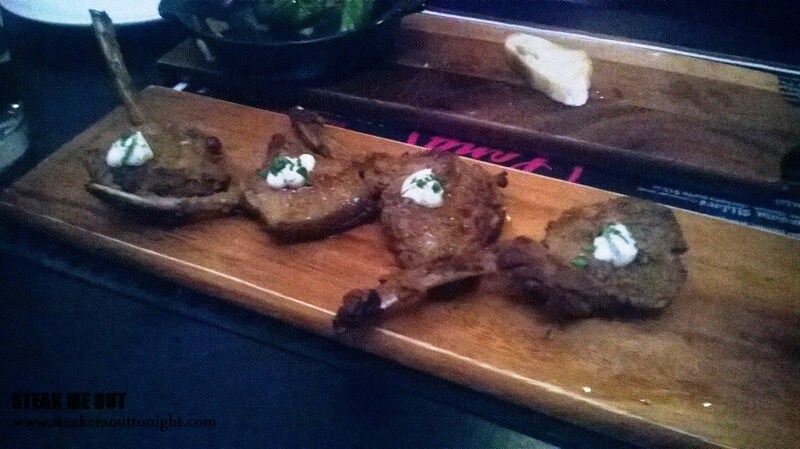 Posted on February 6, 2014 February 6, 2014 by AdrielPosted in Melbourne, SteakLESSTagged dessert, Great, Melbourne, pixtos, spanish, tapas.